The Reserve Bank has given its strongest indications yet on how and when it might use a tool regulating the amount of debt some mortgage borrowers can access from banks relative to their incomes. Speaking at a press conference after the release of the central bank's bi-annual Financial Stability Report on Wednesday, Deputy Governor Grant Spencer said a debt-to-income ratio above five was "pretty high." "We think if we get up over five that's pretty high. And it tends to be the area where potential stresses are going to emerge if there's a shock to interest rates or incomes," Spencer said. He emphasised, however, that no specific level for where any debt-to-income (DTI) tool could be set has been determined. "It wouldn't necessarily have a specific threshold attached to it just as LVRs [restrictions on banks' high loan-to-value ratio mortgage lending] are in the toolkit that don't have any particular thresholds identified. Those are the policy decisions that have to be made in any given set of circumstances," said Spencer. Governor Graeme Wheeler said a consultation paper on the potential addition of a DTI restricting tool to the Reserve Bank's macro-prudential policy toolkit was likely to be released within a couple of weeks. Wheeler said the paper was currently with Finance Minister Steven Joyce because the Minister usually has a couple of weeks to look at such papers and express any views. "The Finance Minister and the [Reserve Bank] Governor have signed an MOU that governs the use of macro-prudential tools. This MOU sets objectives for and requires accountability around the use of the tools. The introduction of DTI limits would require that this MOU be amended," said Joyce. Meanwhile, Wheeler reiterated that if the Reserve Bank currently had a DTI tool available to it, it wouldn't actually use it. Asked under what circumstances a DTI tool would be used Wheeler said, "If we were in a situation where we saw house price inflation start to pick up again and we also had debt-to-income ratios starting to increase again like they have over the past three years. So if they continued to rise, or even remained at high levels, while house price inflation was resurgent again, then they're the sorts of things that we would look at." He also said there would likely be a speed limit, as with the LVR restrictions. "If we did introduce something at some stage it would probably have a speed limit aspect to it just like the LVRs. So if you look for example at the UK, I think they've got a [DTI] ratio of 4.5 where new lending for owner-occupied housing you [banks] are allowed 15% above that 4.5 DTI. So that concept of a speed limit is probably something we would look closely at," said Wheeler. Asked whether there would be any specific targeting of residential property investors through a DTI tool given they tend to have higher DTIs than owner-occupiers and make greater use of interest only loans, Spencer suggested not. Reading between the lines here, the idea could be that a DTI tool would be targeted at owner-occupiers, leaving the LVR restrictions, whereby investors require a deposit of at least 40%, targeting investors. 'I wouldn't say so [that something would be included in the DTI policy targeting investors]. Of course the LVRs we put in last October are residential investor focused. So actually because investors tend to have high DTIs, and you see in some of the charts in here [see below] that the restraint on investor credit has actually reduced the overall DTIs because the risky lending will tend to be high on both counts," Spencer said. The chart below comes from last November's Financial Stability Report. According to KPMG's annual Financial Institutions Performance Survey (FIPS) released in February, New Zealand bank executives believe an ideal level would be between five and seven. The FIPS report also suggested bank bosses were in unanimous agreement that the Reserve Bank's consideration of a DTI macro-prudential tool was happening too late given "most borrowers are already at levels of nine to 12." Meanwhile, when I've questioned them on the prospect of a DTI tool over recent months two of the big four bank CEOs have expressed caution. Below is what Westpac's David McLean had to say when I asked him last November about the Bank of England's 4.5 times, and the Central Bank of Ireland's 3.5 times debt-to-income ratios. "You look at Auckland, the average house price now in Auckland is over $1 million and the average income's only just recently hit $100,000. So neither of those [British or Irish] numbers would work particularly well in Auckland. So I don't want to second guess how they [the Reserve Bank] do it," said McLean. "But do they want to make the whole thing take a haircut straight away or do they want to just start at a level which stops it growing any further? My personal view with the housing market is people worry about the housing market going up and affordability is an issue. But it's worth remembering the opposite situation, which if house prices were tanking is actually far worse for the economy because it's destroying people's wealth and putting pressures on all sorts of parts of the economy." "So in some ways a rapidly rising housing market is what I'd call a fairly high quality problem because it's a sign that the economy's going well, people want to come here. So I think the best thing for the New Zealand housing market would be if the growth tailed off and it didn't increase for a long time, and economic growth was happening which would gradually improve affordability. I don't think the right answer is a big crash in house prices," McLean said. And in February ASB's Barbara Chapman said the Reserve Bank ought to think about a potential DTI macro-prudential tool in the context of which part of the housing market it's concerned about. "...We looked quite hard at first home borrowers and has their debt-to-income ratio changed to the point that we might think that it's of some concern. And what I was quite surprised about was how stable that ratio had been over time. And so while obviously it's something the Reserve Bank needs to think about, I do think you need to think about it in the context of which part of the market might you be concerned about," Chapman said. "And if you look at the fundamental drivers in New Zealand around what makes for a stable borrowing market, it is more around people's cashflow. So it's more around people's ability to repay, which is a lot to do with interest rates and a lot to do with unemployment, more so than some of these other multipliers. So I think there's a number of things that really need to go into that mix." Asked for specific figures on the DTIs of ASB's borrowers who are/were first home buyers, Chapman said she didn't have the report with her. "But what I looked at was a three year view of debt-to-income for first home buyers and it was remarkably stable," said Chapman. The DTI debate comes against the backdrop of a household debt-to-disposable-income ratio at a record high of 167%, as demonstrated by the chart below. The Reserve Bank says an increase in the share of borrowers with high DTI ratios has contributed to the rise in household indebtedness. "These borrowers are vulnerable to debt servicing shocks, such as higher interest rates or a fall in income. This makes them more likely to default on their mortgage or cut consumption sharply, and makes them more likely to sell their house to repay their mortgage, in response to mortgage affordability shocks. If a significant proportion of households have debt burdens that are unsustainable in the event of an affordability shock, financial stability could be threatened by direct losses on bank mortgage lending and by indirect losses on banks’ other assets, caused by an economic downturn," the Reserve Bank says. Banks have been reporting DTI ratio data on new lending to the Reserve Bank since early 2014. "Banks are in the process of improving the data quality. The preliminary data are likely to overstate the share of lending at high DTI ratios, due to data collection issues such as the incomplete capture of borrower incomes. Despite these data challenges, it appears that the share of new lending at high DTI ratios has remained elevated." "Banks report that the share of new lending at DTI ratios above five has continued to grow over the past year for first-home buyers and other owner-occupiers, to 36% and 42% respectively in March. For investors, the tighter restrictions on high-LVR investor lending have had a significant impact on high-DTI borrowers, reducing their share of investor lending from 58% to 52%, the Reserve Bank says. "Preliminary Reserve Bank analysis on the impact of higher mortgage rates on recent borrowers suggests that many would struggle to service their mortgage if mortgage rates increased. Mortgage rates can rise quickly. For example, the average new floating mortgage rate in New Zealand rose from around 7% to over 10% between early 2004 and 2007. Fixed interest rates may give some borrowers time to adjust to higher interest rates. However, based on banks’ current mortgage portfolios, about 40% of mortgages would re-price within six months and 60% within a year." Back in 2013 when the Reserve Bank's macro-prudential toolkit was put together, via the MoU between Wheeler and then-Finance Minister Bill English, a DTI tool was left out. Four tools were included, most notably the one in use that restricts high loan-to-value ratio residential mortgage lending. At that time the Reserve Bank did not appear interested in a DTI tool. In the 2013 MoU the best the Reserve Bank could muster in terms of DTI limits was a vague mention of a potential debt servicing tool at some unspecified time in the future. The central bank noted areas of regulation "not in scope" for the "base framework," but that "may form part of the bank's future work programme" included: "The case for incorporating debt-servicing capacity into the macro-prudential framework." Adjustments to the Core Funding Ratio - altering the amount of equity, retail funds and longer-term wholesale funding banks have to hold. This is currently set at 75%. A Countercyclical Capital Buffer - effectively banks holding more capital during credit booms. Adjustments to sectoral capital requirements - increasing the amount of capital banks must hold in response to sector-specific risks. Quantitative restrictions on the share of high loan-to-value-ratio loans to the residential property sector. Could you do a first home buyers vs stress by interest rate? Pretty much shows the game of debt specuvestors right there. When the UK measures were introduced only 9 percent nationally of all new mortgages were above 4.5 DTI ratios. A cursory look at the chart above suggests Auckland and New Zealand have a problem. So...~ 40% of All Borrowers would have at Severe Stress in mortgage rates went back to levels about those of 10 years ago? Looks high to me, but if so no wonder Graham Wheeler is out on the hustings......QE...Don't ya just love it! ~30% of recent borrowers (borrowed since October 2016), Something like 9% of borrowers who borrowed before then. Still enough to make quite the impact if it happens. The 40% figure seems low. People were having trouble with the high interest rates in 2007. Now with even more debt things would be far worse at 8%. Whereas my calculated point where we'd be paying the same interest as 2007 is 6.52%. That's not even a 50% increase in the typical card rates listed on this site. The graph describes "severe stress" as being unable to make essential payments. So those borrowers will be choosing between keeping the lights on or eating that month. Correct. People were finding that they were accumulating credit card debt at that time. If they didn't accumulate more debt (with high interest rates) they would be choosing to not use heating, have cold showers, starve, etc. It's a bad scenario at 6.52%, it's worse at 8%. I knew people in 2007 where the bank was refusing to lend them more as their expenses were out of control relative to income. They were fortunate when RBNZ eventually reduced interest rates or things would have gotten worse. The thing is will there ever be such high interest rates ever again? my view is no. This isnt great as what I see having the same effect is far higher un-employment rates and poorer earnings in effect giving the same effect (in-ability to pay) but worse house prices also way down. I would fail to get a mortgage for my currently mortgage - free home if this rule were to apply . I assume that the mortgage would be 5 x times the annual gross income ? My modest 5 bedroomed home in Greenhithe has a rateable value of $1,6 million , its fully paid up and we dont earn enough to pay a Mortgage at a ratio of 5 on that value . An its a mess that we should never have allowed the country to get into. But a bank wouldnt give you $1.6 million today either - that has nothing to do with DTI ratio being introduced by RBNZ. In 1990 (in New Zealand) the household debt to GDP ratio was 28%. 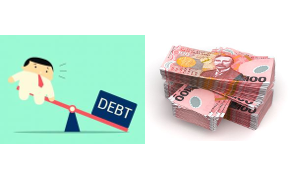 24 years later in 2014 (latest stats available) the household debt to GDP ratio was 88.9%, (probably hit 97% in 2017) and the household debt to income has reached 176%, (2017) which is higher than prior to the GFC (Source: Bank of International Settlements). Sustainable - hit the reset button? Why wouldn't DTIs and LVRs i.e both apply to investors or just DTIs? Why have LVRs for investors and DTIs for home owners???? Yep. The devil is in the detail. What is the level, will the level change, when does it first kick in, who is it pointed at, are there two levels etc. Something needs to be done. Quickly in my view. Personally I don't think there should be two levels. If its risky for first home buyers its risky for investors too. This is so wrong. Some of the places in the US that had maximum speculative fever prior to the GFC were locations with unrestrained land subdivision and construction. The son of a friend of mine "owned" 25 homes at one point and was a multi-millionaire... on paper. He got too greedy and didn't sell prior to the home ponzi scheme collapsing. This example was in the suburbs surrounding Phoenix in Arizona. The amount of construction there was just amazing... and speculators sometimes didn't even bother to attempt renting out the homes but instead let them sit unoccupied as it was less hassle or risk. Sometimes one needs to put in place limits so that the fools do not lose everything when there is a hiccup or market turn. I was quite surprised to find that banks here in NZ do not use DTI as a criterion in regards to lending. This lack of DTI was a primary cause for the GFC in the US (in the lead up to the GFC the primary criteria for loan approval appeared to be the capability to fog a mirror and scribble a signature on the loan documents). The primary issue is NOT migration, it is speculation. If it was migration, the rent prices would have escalated at a similar rate as home prices. Instead, rent prices have remained on a rather mild increase rate and the home prices have escalated in a rather bubblicious fashion. Are you saying the big banks in NZ dont use a form of DTI when assessing mortgage applications? I dont think that is the reality - every time I have applied for a mortgage they most definitely do base it on income. Do you not think its possible that the widely practised strategy of negative gearing is artificially suppressing rental values somewhat? If specuvestors are in it for the capital gains, and as an extra perk, use the various mortgage debts on their properties to reduce the tax liability on their other incomes by deliberately making a loss, wouldn't that be a downward pressure on rents? Are you arguing landlords are happy to take a lower rent than what they can get on the market? Most indications suggest they put it up to whatever they can get on the market. I'd suggest that's a rather charitable view of their behaviour. Honestly, I don't know. I was just pondering on it. To be honest I was pretty surprised when I first came across the whole notion of negative gearing. It seems incredibly dangerous investment behaviour to me, and yet there are so many advertisements and schemes being taught, that it seems pretty wide spread. We see it as an Ozzie banking innovation, in that it explains why peoples tax records would not match their home loan application accounting details. And tips punters into cash loss making ventures, they'd otherwise refuse at. In Ozzie there are buyers clubs that investulators pay fees to join that do club deals on project pre-sales and house/land/developer gteed 3yr rental yield ventures, (meet the lender on site sort of thing) - but often in the middle of nothing too. Its an art-form over there! They run life improvement/life help/life coaching seminars in order to hook punters up! Hire out big hotels come for, the works! These seminars will even "help" you subdivide/cross lease your section! Big corporations use it by the name of tax shield. but really for them and funding OS operations, its about saving deployed equity and transferring out profits. Their trick is: There is NEVER any real loss to them! .... and the average income's only just recently hit $100,000. Really? I would have thought the h'hold gross income is possibly 100K in Auckland. "But it's worth remembering the opposite situation, which if house prices were tanking is actually far worse for the economy because it's destroying people's wealth and putting pressures on all sorts of parts of the economy." Yes, but it is a bit ripe for a banker to be stating this when you're juicing and profiting from the bubble. "So in some ways a rapidly rising housing market is what I'd call a fairly high quality problem because it's a sign that the economy's going well, people want to come here. So I think the best thing for the New Zealand housing market would be if the growth tailed off and it didn't increase for a long time, and economic growth was happening which would gradually improve affordability. I don't think the right answer is a big crash in house prices,"
Specious argument. If an economy is "doing well" because of a speculative bubble, you're putting the cart before the horse. A crash in house prices is not ideal, but neither is propping up bubbles to avoid pain. People like McLean are part of the problem. Very well put J.C.; The speculative bubble is a false economy and one that is completely unsustainable. Worst of all is that it pushes out the real economies through making the cost of living decoupled from wage growth. That pushes out business as they find it harder and harder to recruit staff and retain staff to a point where they can't function as a business. We need a property market correction to link the cost of living back to affordable property prices. I think you're wrong. Economic bubbles promote income and wage growth. They are not independent. Sure, asset price growth may rise faster than income growth. And what will be the impact of this correction? It could be far worse than you could possibly imagine on the overall economy. McLean states this in cotton wool and I agree with him but I have no idea what the collateral damage could potentially be. If Auckland house prices collapse by 25% - we would be back to prices seen just a couple of years ago. It would be bad for banks and people who bought recently, but it wouldn't cause any widespread ripples in the NZ economy - and would undoubtedly be a positive on the whole. Why would there be no "ripples"? Have you worked that out yourself or did you read it on the internet? 1) It's better to let the market re-correct now whilst we still have functioning economies such as the IT industry, education, exports, tourism etc... A lot of these are severely hit by the high cost of living and their salaries are only able to gradually adjust otherwise they hit a break point and move out or go under. 2) If the property market carried on to the completely decoupled price levels from the cost of living and caused most of these economies to collapse and move out. That's would also result in a property crash, but one that we find extremely difficult to recover from as the supporting economies would be virtually gone. Result = market crash and sever recession. Being dependent on property price values increasing for GDP growth is a road to disaster. But that's a mute point considering that all this is far beyond our control or even Nationals control. The top end buyers are gone and the property market is re-correcting whether you like it or not. Auckland North shore and Central is currently dropping -$50k a month from the latest stats info. @J.C: You've clearly not been through a property market crash before. No I haven't. Have you? I think 10 years living and working in corporate Japan gives me a relatively good understanding of the negative impacts of bubbles. You know, the country where the impacts are being felt 30 years later. Do you have any idea about the impacts of a property crash in NZ beyond your gut feeling and heuristic experience of the past? By the way, how do property price values impact GDP? They don't. The activity that asset price bubbles generate have an impact. I think I'm simply aware of what I don't know. However, I find bankers like McLean a bit rich when they they ultimately are absolved of any responsibility. The punters are carrying all the risk, and the non-punters will be hit too if it goes pear shaped. McLean might disappear and take his massive severance with him. I've been through a few. Property proves it's lack of liquidity in a down turn and often gaps down in value. Lenders become concerned and ask for up to date values which have to be based on very recent sales. Therefore distressed sales drive the market down as a whole. Buyers lose confidence and it becomes harder to strike a deal. Think the GFC downturn on a big scale. Cash buyers do well and look for quality income streams. Developers try to cash in their Lambos and launches as projects are called off and lending facilities are pulled. A good time to spend a few years in a warm climate until confidence starts to come back to the market. I really can't think of a historical precedent for the global economic predicament we are in now. Yes, markets are cycles, yes tulips, yes bubbles and busts yadda yadda. Debt cycles. Round and round they go. However, this time *IS* different. GFC should have been the end of the debt cycle with a major period of deleveraging followed by increased productivity and actual real genuine growth....but it wasn't. There was a little bit of deleveraging, mostly by corporations (not households), but in light of the healthcare and pension time bomb approaching and the pedal to the metal of debt in every year since 2009, asset bubbles, debt bubbles and anaemic growth, there was not nearly enough. We are all fucked. Boomers are fucked because we can't afford their pensions and in most of the developed world, aside from immigration artificially inflating populations, boomers did not replace themselves in numbers, and at some point, could be now, could be in 10 years, there is going to be the mother of all asset price crashes. So boomers are screwed. Gen X are screwed, because either they were wiped out by 2008, and still heavily indebted, suffering low wage growth, even less prospect of decent pensions than the boomers, and some, still haven't even managed to get on the property ladder or only recently did so have 3 more decades of debt to look forward to, possibly at some point with negative equity if/when asset prices crash again. I don't think I need to explain why millennials are screwed. But let me also add the obesity and growing mental health crisis across the world that will put unprecedented pressure on both health services, insurances services and decrease productivity. A good proper crash, with mass debt forgiveness is probably the only thing that could reset this mess and save any of us a chance to become healthy, productive, equal societies again. Not all will be wiped out. I have NO DEBT and own my house outright. I lived within my means and income and enjoyed the odd overseas trip too. I'm also a Gen X and I rode off the back of my older Baby Boomer siblings and our parents were from the "Silent Generation", so we got home schooled on how the whole boom to bust scenario plays out thankfully. The first graph (Figure 3.6) shows that 50% of investors, 40% of owner-occupiers and 35% of first home buyers have a DTI of above 5. A DTI OF 5 WOULD HAVE SOME VERY SERIOUS EFFECT IN SLOWING DOWN HOUSE SALES ! And... a DTI of 5 is considerably higher than what other countries have already put in place as a limit. People that have a DTI>5 in Auckland are likely to experience in person the wonders of excessive leverage. Sometimes it works, sometimes it doesn't. When it doesn't, zero or even negative equity frequently is the result. I never realized that NZ loans are ALL ninja loans. I would have thought that banks would have sorted this error after ninja loans were a primary cause of the GFC starting in the US. The DTI would apply only to new lending but what happens if you need to refinance an existing loan which has DTI above 5 ? This could happen to many of us. Perhaps you should have thought of that before taking out a loan you cant really afford to service? Typically what happened in the US after the banks starting going bust was that no bank would be interested in re-financing a mortgagee in financial stress because the banks were already up to their eyeballs in bad debts. So you will either need to get a secondary job to keep afloat or sell at a loss before the bank sells it for you. For home owners, as long as you make your payments they dont seem to mind. Banks dont want to shoot their profit generatorss anymore than anyone else. Bring it on! DTI of 4 sounds right. The DTI setting should be based w.r.t history. 2.5 to 3 times AN INDIVIDUALS (medium) salary (not house hold earnings) should buy the medium house. ....ignore averages in a bubble. Calculate a DTI that reflects that PROVEN and LONG history of success bank setting. Otherwise it's another 'Clayton rule', meant to defuse the Masses anger (as they slowly wake up !) and keep the music playing. Shouldn't banks already had some form of DTI ratio to protect themselves / investors / depositers? They do but the rules get bend depending on the overall circumstance and the risk evaluation of the applicant. No doubt there is probably some mortgage fraud thrown in that will be concealed. I suspect the bank DTIs are still too high to be sensible. I'm hinting that I'd like to know what the real numbers are rather than the reported numbers. We won't really know the fraud numbers until after the fall, but that Chinese linked outfit that fell over a couple of months was riddled with it, so I'm guessing it'll be high. I'm guessing maybe 25-30%of new originations in the last 2 years were 'optimistic' in their numbers? We do know it was rife in the US's last bubble. It's also been a major problem in Canada. HCG were tipped off about mortgage fraud by a large number of mortgage brokers. The ones that made up more than half of their mortgage business. The banks here aren't checking and it's only because another mortgage broker tipped off a bank that the Chinese outfit were exposed. No investigation and apparently no actual regulation. There's no fraud until everything fails, an terrible attitude by the banks and the regulators. Hey no harm no foul right? But by God we'll lock up any solo Mum's who 'forget' to tell WINZ when their new partner moved in. My own experience is of reckless lending in NZ. Hubs a Kiwi, myself a Brit. Moved from UK to NZ 8 months ago, zero credit history in NZ as my husband has been in the UK for 12 years. We run a UK company from NZ, the bank said "no problem, we can lend 75% on your declared overseas income at x11 that income" ELEVEN TIMES!?!?!?!?!?!?! It was a bit of a shock to us because our last experience of applying for a mortgage was in the UK, where there were extremely rigorous affordability checks (often they scrutinise your individual monthly outgoings) and income verification, in addition to the 4.5 max DTI but our actual DTI was 1.8 because we are not debt hungry muppets who wanted the biggest house we could possibly afford, we have 75% LVR and our UK mortgage represented 9% of our net monthly income but they still gave us a rigorous check in the UK! Don't worry a mortgage broker should get you more, so you could get the place you really want! Note to self; The Ozzie banks rarely know how to lend! Sounds like Westpac would make a killing if only they ran a home loan operation in Britain and Ireland. They should. When Auckland median house price is 10x median income, it shouldn't be a surprise. Keep in mind that 5x median income would be say loan of $250k... which isn't bad at all (depending on how DTI is calculated). Seems like a reasonably low threshold for them to define as severe. Still, much over that = a lot of debt or not much income! There has been quite a few news reports about the level of financial fraud via mortgage brokers in Australia over the past few months and it is starting to have an impact now on those banks that have been caught up in it. I guess the OBR removes that problem for them, because if they go bust, they're relatively OK, as it their depositors etc that are the losers, and in the mean time they get marvellous bonuses. Uh, I do not agree. In fact arguably the implied insurance from the Government makes things worse for them. On top of that as a depositor why not put you money where you can get a guarantee? Why is it you think the tax payer should bail the depositor out? why dont investors and depositors insist on insurance? Because it makes the banks even more irresponsible in their lending practices if they know that the government via the taxpayers will bail them out! So considering that our banks are Australian owned and that they may have practised "bad lending", knowing that our banks are owned by Australia and all profits made off the back of New Zealanders are repatriated back to Australia, do you still want your NZ tax dollars to bail out their massive profiteering banks at the social cost of our own people in NZ? NO! Even John Key had the sense to say this will never happen under our OBR policy! When auction clearance rates fall to around 65 per cent in Sydney, a housing downturn will be official, property analyst SQM Research says. Remind me again, what are Auckland clearance rates ? AK clearance rates are now the low 30's lol. BANG! Wow, reading that article I see that the Sydney and Melbourne property markets are still hot. Sydney is still hot and boiling. Instituting a DTI is very much not the same as taking away credit. Using a DTI, is a crude measure of whether the borrower can in fact service the loan payment. A rational DTI should be indexed to the prevailing mortgage interest rate with some buffer to account for possibility of an interest increase. DTI DOES NOT take credit away, it just reduces it. The wealthy can EASILY be limited to buying all the houses if that is a reasonable fear by taxation and rental laws that favour tenants. High housing prices RUIN an economy and RUIN the lives of those that are first time buyer, (UNLESS the GAME continues long enough FOR THEM). BUT someone will suffer BADLY and IMHO unfairly. This is 'end of empire' stuff, debasing currency (by the FED via central banks that are owned by the same Uber wealthy (T)PTB) to try to extend matters. Housing and other bubbles are symptoms of this desperate act. Read history of previous empires and how they collapsed, it my repeat but if does Rhyme ! Sounds like you're saying it will increase the number of people who qualify as "irresponsible, smashed avocado-eating spendthrifts, who if they'd only work hard and stop spending would be fine". DTI will return house prices back in line with real NZ incomes eventually. It is only the last couple of generations that are used to borrowing money as opposed to saving it. Credit has been cheap and easy, until it isn't. So one needs income of about 200k to buy a house in Auckland ? House prices have galloped ahead of income during the last several years..
How does one adjust for that and still make loans available/affordable to FHBs ? Quite the opposite actually, DTI will have an effect on the prices of houses so one SHOULD NOT need $200k income to buy a house in Auckland. Prices are high because of speculation. Rich overseas Chinese were buying $700k Otara mansions because they could. Now they can't, so sellers can only sell for what the market dictates. I always look at the 2014 CV on TradeMe to get a good indication. $350k seems about right. That means you only need $70k income to service an average Otara house. It depends on the area RichMuhlach. In Remuera and wider DGZ you need at least $200k income to live in a derelict 2-bed unit. I'd say (agreeing with yourself, I think) that Remmers will be safe for a while. Enough people who aspire to live there have likely been able to cash up some properties and move in, so it may not have much reason to go down. Saw a house in Kohi, not a mansion by any stretch, but nice $1.3 mill. I would rather live in Kohi, go windsurfing a bit more easily, walk down to beach and have fish and chips. So people like me would look at Kohi before Remmer's, and if prices are reasonable in Kohi, and some start to look at other areas then prices may start to drop. They may not but we will wait and see. Places like Remmer's could be last to fall. True, I think there are a number of places that are more desirable than Remmers for objective reasons - nicer views, geography, proximity to other benefits etc. Possibly too much value is possibly placed on Remmers for reasons DGZ raised earlier...those "feeling like you've made it", "1050 postcode is your personal brand" elements. Kohi is a suburb I love for that reason, but many properties are on leasehold land which makes it very unattractive to buy into. DTIs would not target investors as the additional net income from the property is fully available to service the mortgage. Whereas, for an individual net income less other non-mortgage expenses eg transport, food, phone, power etc is the amount left over to service a mortgage. The Reserve Bank is working on the policy that the 60% LVR rule will take care of the investors, a DTI of 10-15 is not an issue for investment properties. A DTI of 10 for an investment property would be cashflow positive. way to twist it, technically it is negative cashflow as you are topping it up. But that is only short term if all goes well as like you say principal goes down by 6.5 per year then you will have rent increases. have you done a projection to work out how many years before it pays for itself without your top up with variables worked in? Sharetrader, I don't really run with projections as to when a property will be cashflow neutral after principal payments, as there are too many variables ie interest rates , rent levels. My thinking is the property is a 3br, 2 bath , 1 garage townhouse on valuable land in a high end suburb, that will contribute to paying itself off and is 200m from Courtney Place and 800mm to the CBD. My philosophy has been over the years that if I secure deals such as this the money will take care of itself. My question to you, what is the annual capital appreciation required for you to exceed investing your investment funds in a 5 year term deposit? For that matter, if you wish to compare similar risk, what level of capital appreciation is required to generate a return that is higher than investing in the NZX50? As a comparison, compare purchasing any of the utility IPO shares such as Mercury, Genesis, or Meridian. Make sure that you look at the dividend returns to understand a reasonable investment return. The capital gains have been rather good, but wasn't the intention when purchasing. In regards to self management, how much funds have you set aside for maintenance costs? One thing I really enjoyed when I was renting was that when something goes wrong (for example, the hot water cylinder starts leaking) all I had to do was call the landlord. >Good rental income as compared to the home value, although the negative gearing demonstrates that your primary goal is to use leverage for capital gains speculation instead of investing in a rental property. True. You'd think that use of negative gearing should be added to the bright line test - i.e. if you use it you should pay income tax on any capital gains from the sale of the property in future. Yankiwi, no capital appreciation required. I contribute 2K per annum for a 6.5K increase in my net worth per annum (as debt reduces 6.5K per annum). Body corp 4K, rates 2K, 1K maintenance, minimal maintenance as Body Corp takes care of grounds painting etc. And in this suburb tenants tend to be IT workers and those in marketing and banking so the properties don't tend to get knocked around. Regarding NZX50, I would not invest in this sector, any share purchases tend to be in Aus resource stocks if opportunities arise. Such as at present many Aus gold small to mid cap producers are being sold off as Van Eck GDXJ ETF is rebalancing on June 17, so forced selling of these stocks despite the fundamentals. Though my research indicates that many of these share are being transferred to an Irish listed Van ECK ETF. Basically I will go into shares if I can see a possible 50-100% return over the next 6-12mths. In US if UAA (underarmour) dips further I will take a large position. Interesting, I didn't realize that 100% of property value loans were still being made. For some reason I was under the impression that one had to put 40% of home value forward as a down payment. Thanks for the information, best of luck to you. You can borrow 100% if you have the spare equity in other properties, ie equity in other investment properties >40%. In this environment, this is not an appropriate risk to reward scenario for me. Maybe when I was younger and was looking for the high risk/high reward scenarios, but at this stage I'm quite happy to work with more conservative 4-10% returns with little downside risk. Again, regards and best of luck to you. Thanks for your rational responses. So how does using equity from one property to secure 100% mortgage on another work in a housing crash or economic downturn? If you can no longer afford to top the 100% mortgage and meet the repayments, the bank forces a sale, but can't recoup the money lent because of zero equity, does it then come after the house that you used as a "deposit"? Yikes. That is going to get ugly real fast if that is what a lot of the recent house purchases have been based on and the market continues its downturn. That's how irresponsible Ron Hoy Fong's advice has been. He said losers (his words, not mine) should use their parent's house as equity to buy their own home. This was during that pivotal period in November 2016 when house price growth started to decrease. Now imagine if the loser couldn't keep up with the repayments and bank was forced to sell. He would effectively lose his house, as well as his parents, all because of Mr Ron Hoy Fong. Over the whole portfolio there is no topping up as maximum allowable LVR is 60%. Properties purchased previously including some commercial are strongly positive cashflow, no money needs to be put into the rental account. The properties may decline in value, but I have never seen the rent for well located property decline. So we enter a recession all that will happen is interest rates will decline. The large study by the Harvard professors Reinhart and Rogoff found that property bubbles suppress interest rates for at least 10 years. So I would not bet on increasing mortgage rates, 2-3 hikes and Auckland is in a dire state the country slips into recession, and you guessed it the reserve bank cuts 3-4 times rapidly. People may say rates may go up irrespective of the reserve bank, but this does not happen in the real world, if the government wants low rates to stimulate the economy they will get these low rates. What happens to property values outside the Auckland / Waikato/ BOP triangle when mortgage rates settle in the 3s, and term deposit rates are in the 2s? They will all be cross collateralised, so they are all on the table. House of cards much? Hardly a house of cards, LVR at about 50%. Property portfolio paying itself off and providing net cash. No apartments, either family homes or townhouses in suburbs with minimum decile 8 schools (majority decile 10 school zones). DTI possible to protect many from going bust but only with change of national come election. A change of government won't protect those who are already over leveraged and neither will it protect those who are still trying to buy. Governments aren't bankers, they are politicians and the pollies are always REACTIVE rather than PROACTIVE. It is the banks that dictate "available credit", "Terms and Conditions", like changing the rules to 20% deposit against the term loan length and pricing via interest rates. The entire point of a government is to be proactive. To use combined population finances to address societal needs in the present and in the future. To invest in future capital spends, pensions, infrastructure, debt management, security, etc etc. A government who is always on the backfoot and fire fighting is an example of poor governance, planning and management. Give me a recent example of when a New Zealand government was pro-active instead of being re-active to the polls and offering policies that are too little too late. I would guess you have to go back to 1980s Labour, when National and Labour switched sides and Labour liberalised the economy. John Key campaigned on action then delivered none. Labour before him were fairly steady, and did pay down debt, though I'd guess their main proactive thrust was in social reform - e.g. homosexual rights (which gave the right the chance to characterise them as all about gay stuff etc.). Yes, but on the financial side of things where it really counts, no NZ government has touched it! Instead we get social fluffies that don't make any real difference on an economic scale. New Zealand has not seen a PRO-active government for decades! They all pander to the polls and lack the forward thinking that New Zealand needs to avoid becoming the next Greece, Spain, Ireland, Argentina, France and the new Brexit State! You make a great point. I forgot that John Key worked for Merril Lynch but to be fair he wasn't a banker, but a Forex Trader. Not quite the same as an investment banker. There's probably been too much cosying up of the finance sector and the government in recent times, and too many revolving doors. E.g. Simon Power went off to a nice job in Westpac's Wealth Management area after setting up the Kiwisaver gravy-train of funds encumbered by unreasonably high comission fees.